Recorded and sung by Beyle Schachter-Gottesman, 1970s. February 21, 2019 marked fifty years since the passing of the Yiddish poet Itzik Manger. He was born in Chernovitz (then Austria-Hungry) in 1901 and died in Gedera, Israel in 1969. To honor this date, I found a recording of Beyle Schaechter-Gottesman (my mother) singing Manger’s song Eynzam (Keyner veyst nisht vos ikh vil) with a different melody than is most commonly sung. Unfortunately, she is interrupted before the end of the song, and does not complete it. Attached are scans of the words with the more commonly heard melody as found in the Mir trogn a gezang song collection compiled by Eleanor (Chana) Gordon Mlotek, NY 1972, pages 162-163. This includes transliteration and lyrics in Yiddish. I have not yet found another recording of this Chernovitz version. The singer Janie Respitz is a Yiddish educator and singer from Montreal. Janie incorporates her singing in her lectures and shares her passion and knowledge of Yiddish folklore with her concert audiences. As she states at the beginning of this video-recording made in Montreal, July 2017, she learned Berl der alter shiker (Berl the Old Drunk) from the late Max Satin, a resident in the Jewish Geriatric Hospital in Montreal. Berl der alter shiker is similar to a previous post Shtey ikh mir in ayn vinkele sung by Itka Factorovich Sol. Respitz’s song is closer to the version found in Skuditski 1936 Monopol, monopol (scan of page attached) but the drunk does not have the conversation with the moon. 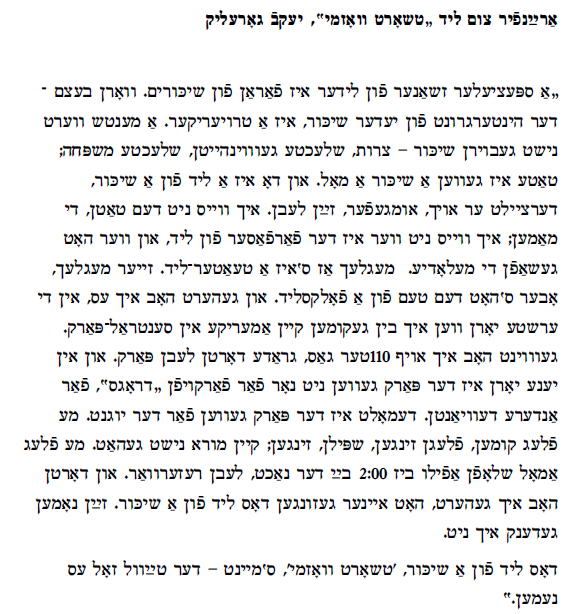 In his article Geyt a yid in shenkl arayn: Yiddish Songs of Drunkeness (Field of Yiddish: Fifth Collection, 1993), Robert A. Rothstein analyzes versions of the song and points out that the verse about the wife drinking the whiskey all up is from Velvl Zbarzher’s poem Der shiker (The Drunk) found in his Makel No’am מקל נועם Vol. 3, Lemberg 1873. Shmuel-Zanvil Pipe also pointed this out in YIVO-bleter, 1939 (vol. 14: 339-667) Perhaps we should consider the whole text a folklorized Zbarzher song? bin ikh af im in kas. un ikh trink azoy vi fun a fas. un der bronfn gist aroys. Zi vet nokh hobn tsu gedenken. Vifl mol ikh hob ir shoyn farshvign. Haynt vel ikh ir nisht shenken. Kh’ob genumen dos fleshele mit bronfn. un zi trinkt es oys bizn letstn tropn. Du bist dokh a hartsiker rikhter. Zol shtendik regenen mit bronfn un mit bir. Ikh vil keyn mol nisht zayn nikhter. Af mayn keyver zol zayn ongegosn. Mit bronfn un mit bir. Dos iz bay mir der iker. do ligt Berl der alter shiker. I am angry at it. and I drink as if from a barrel. and knock the cork out. and the whiskey pours out. Today I will argue with my wife. Today I will not spare her. Put it at my head. and drinks it all to the last drop. you are a compassionate judge. So I won’t ever have to be sober. Der freylekher kaptsn (The Happy Poor Man) is an upbeat song I recorded from Jacob Gorelik in 1985 in New York City. The song follows the alef-beys for 23 verses. Der freylekher kaptsn is also known as Der freylekher khosid and Hop-tshik-tshak, which is a dance or dance step. 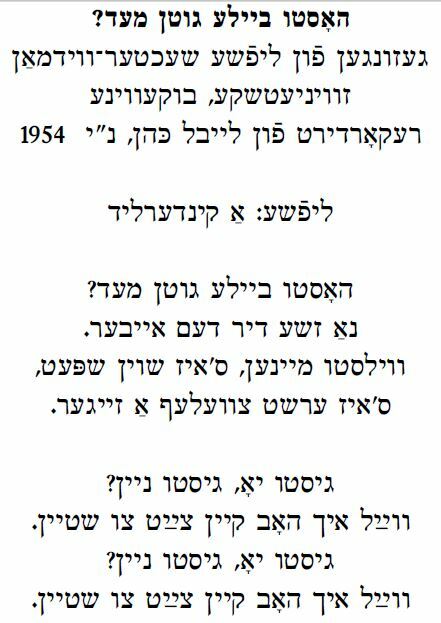 As he says in his spoken introduction, Jacob Gorelik sent this song to the Israeli folklore journal Yeda-Am and it was printed in 1967 (Vol. 12 no 31-32) with the music. 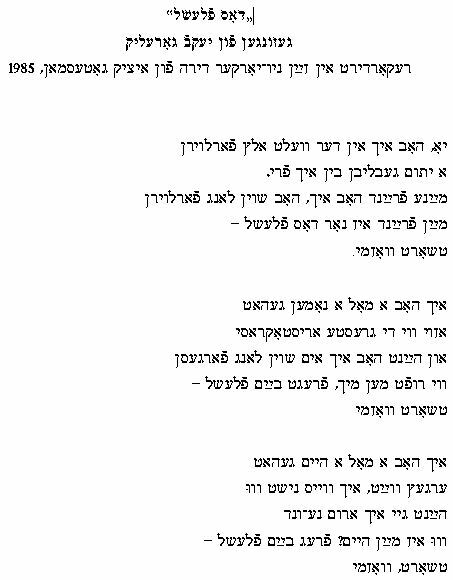 Attached are scans of those pages which include the Yiddish verses, a Hebrew translation and a brief commentary (in Hebrew) by the editor on the song at the end which includes references to other versions of the song found in other song collections. When he sang this for me Gorelik was reading the lyrics from the journal. Gorelik also pointed out the similarity in melody to Khanele lernt loshn-koydesh (words by A. Almi), a song that was later recorded by Chava Alberstein and the Klezmatics among others. The verse that corresponds to the letter ע begins with the word “helft” – because, as Gorelik explained, in the Ukrainian Yiddish dialect the “h” sound at the beginning of the word is often silent. A humorous parody of the song about kibbutz life was collected and published by Menashe Gefen in issue 3-4, 1972, of the Israeli periodical מאסף, Measaf. 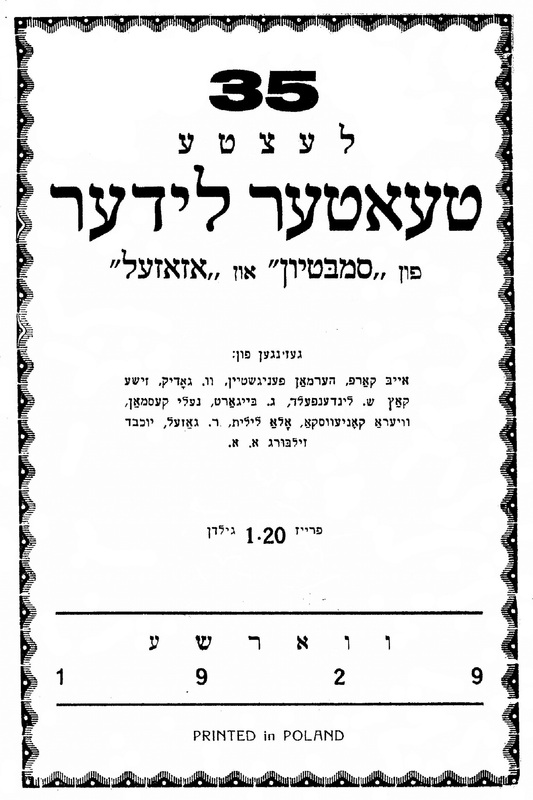 Two scans of that are attached as are two scans of the version collected by I. L. Cahan and included in his 1912 publication Yidishe folkslider mit melodyen. Lekoved mayn tayern gast, Itzikn, vel ikh zingen a folklid, an alte, alte folklid – “Der freylekher kaptsn”. Un es geyt in gantsn loytn alef-beys. Du veyst kaptsonim zenen ale mol freylekhe. Gehert hob ikh dos mit etlekhe tsendlik yor tsurik fun mayn froys a shvoger: Hershl Landsman. In Amerike hot gebitn – in Amerike tut men ale mol baytn – gebitn dem nomen af London. Far zikh, far di kinder, zey zoln kenen vern doktoyrim. Un er hot es gehert baym onfang fun tsvantsikstn yorhundert. Hershl iz shoyn nito; lomir im take dermonen. Landsman is shoyn nito. Zayn froy iz nito shoyn. Mayn eygene tayere froy iz shoyn nito. Der freylekher kaptsn. Es geyt loytn alef-beys. Gedrukt iz dos in Yeda-Am. Flegt aroysgeyn in Yisrol a vikhtiker zhurnal, a folklor-zhurnal. Unter der redaktsye fun Yom-Tov Levinsky, 1967 iz der zhurnal aroys, der numer. Ikh bin mir a khosidl, a freylekhe briye. Bin ikh mir a khosidl, on a shum pniye. Bin ikh mir a khosidl, a khosidak. Tants ikh mir a freylekhn hop-tshik-tshak! Borves gey ikh mit hoyle pyates. Tu ikh mir on fun eybn dem yarmak. Der dales iz bay mir afn pritsishn oyfn. kh’loyf un loyf azoy vi a durak. abi ikh shtop zikh on dem baykh. un kartofles far a pitak. un shpiln, shpil ikh af mayn orgl. vayl shikh zaynen gole lates. ven met kumen di nekhome af mir? Du vest nokh heysn mitn nomen – shnir. mayn vayb a malke un ikh a meylekh. Ikh trog shalekh-mones fun tir tsu tir. In honor of my dear guest, Itzik, I will sing the folksong, an old, old folksong “The Happy Poor man”. It goes according to the alphabet. You know poor people are always happy. I heard this a few decades ago from my brother-in-law Hershl Landsman. In American he changed – In America one is always changing – In America he changed his name to London; for his sake, for his children, so that they can become doctors. And he heard it at the beginning of the 20th century. Hershl is no longer here; his wife is no longer here. My dear wife is no longer here. “The Happy Poor Man”. It goes according to the alphabet. It was published in Yeda-Am, that used to be published in Israel: a folklore journal, an important journal, edited by Yom-Tov Lewinsky. In 1967 this issue was published. I am a khosid, a happy creature. I am a khosid, with no bias. So I dance a joyous hop-tshik-tshak! I go around barefoot with bare soles. Up and down I’m full of patches. from top to bottom full of mud. and I dance a joyous hop-tshik-tshak. my head hurts from all my running around. so I dance a joyous hip-tshik-tshak. with potatoes for a penny. and play on my organ. So I am a khosid, a singer. And I dance a joyous hop-tshik-tshak! I take a nice swig of whiskey. We have nothing for sabbath, woe is me. Empty is my pocket with no penny. So I dance a joyous hop-tshik-tshak. to escape far from my shrewish wife. And I drink a shot with real snap. their hungry tongues sticking out. They really want to eat a lot. because my shoes are all patched up. when will I get some relief? Give me a groom with a short jacket. “You will yet one day be called ‘daughter-in-law’. and they are so very cold. you will be good kids. I will give as a tip, a coin. my wife is a queen and I a king. that it’s not good to be vulgar. We have a sack full of troubles. today is Simkhes-Torah, don’t worry. Rose, my daughter, says to me. I have a husband just like you. I carry shalekh-mones from door to door. I take a quick swig of whiskey, really fine. And in my pocket not a penny. 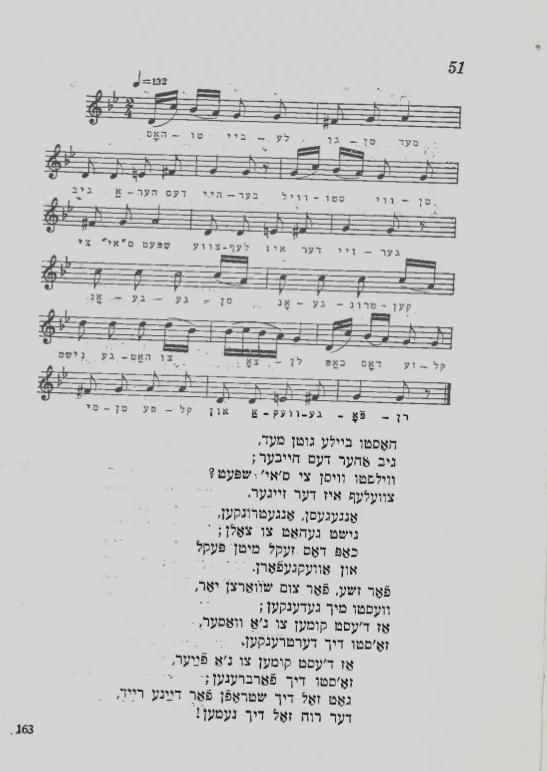 Lifshe Schaechter-Widman (LSW) introduces this song as a children’s song, and it seems that a number of her children’s songs are adapted dance tunes either from Jewish or Ukrainian melodies. 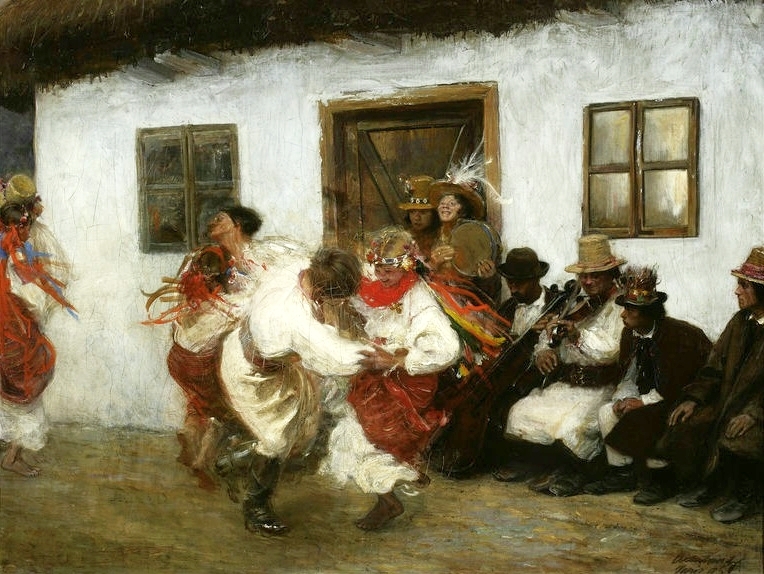 In this case one can easily identify the melody as a kolomeyke*, a couples dance from Ukraine/Eastern Poland/Galicia, referring to the Ukrainian city known as “Kolomey” in Yiddish, and “Kolomyia” in Ukrainian. In the Yiddish song collection Yiddish Folksongs From Galicia in the volume Folklore Research Center Studies, Volume 2 (Jerusalem: 1971) devoted to the work of folklorist Shmuel-Zaynvil Pipe, and edited by Dov and Meir Noy, a variant and its melody is included (song #51, please see below). In the notes (p. 308), Meir Noy lists the other printed variants of this song in other collections and comments that the melody is a kolomeyka. How the Ropshitser Rebbe interpreted this song would be interesting. In both Pipe’s version and the Ropshitser’s version they use the word “heyber” instead of LSW’s “eyber.” “Heyber” (handle/lever) makes more sense. *Musically a kolomeyke is characterized by symmetric phrases with running 16th notes followed by two quarter notes. Here is a kolomeyke that bears my name “Icek W. Kolomej” (Itzik in Kolomey) from “Polish Village Music”, Arhoolie 1995, CD7031. Played by Orkiestra Majkuta. Lifshe: (spoken) A children’s song. Na zhe dir deym [h]eyber. S’iz ersht tsvelef a zeyger. Do you have good mead, Beyle? Then give me the lever [or handle]. But it’s only 12 o’clock. vayl ikh hob keyn tsayt tsi shteyn. Do you give or not? Because I’ve no time to stand around. Researching “Cabaret Warsaw,” a cd of music created and performed by Jews in Warsaw between the wars, I was pointed to a 1929 book called “35 letste teatr lider fun Azazel un Sambatiyon” (Azazel and Sambatiyon being two kleynkunst venues popular at the time). I found the book at Brooklyn’s Chasidic “Library Of Agudas,” along with six tiny books of theater songs and monologues (lyrics only) published in 1933 and 1934 by bookseller and record shop owner Itzik Zhelonek (Zielonek). I decided to track down the melodies for as many of these songs as possible (for more information click here); Itzik Gottesman sent me a version of one of them sung by Jacob Gorelik – this week’s Yiddish Song of the Week, known as “Dos fleshl” (the bottle) or “Tshort vos’mi” (The Devil Take’s It). Gorelik learned the song from a guy in Central Park – back when it was a place people went to “sing and play” (he contrasted that to its present reputation as a place to buy drugs). He didn’t know the man, or where the song came from, but he said it shares its melody with the Russian song “Kare Glaski” (“Brown Eyes,” see Russian lyrics below). The words Gorelik sang were quite different from the lyric printed in “35 letste teatr lider” (texts to both versions are below). Sometimes singers “folk process” what they’ve heard, or they forget the words and re-imagine them from scratch. A special genre of songs are about drunks. Because, basically, the background of every drunk is a sad one: a person is not born drunk – troubles, bad habits, bad family; the father was a drunk. And here we have a song of a drunk, and he tells us, more or less, of his life. I don‘t know the father, the mother [of the song]; I don‘t know who wrote the song and who created the melody. Possibly it‘s an old theater song, very possiblew but it has the taste of a folksong. I heard it my first years in America in Central Park. I lived then at 110th street, near the park. And in those years the park was not just a place to sell drugs, or for other deviates. The park was the for the youth. We came and sang, played, sang. We were not afraid. We even slept there till 2:00 at night near the reservoir. And there I heard someone sing this song of a drunk. I don‘t remember his name. The song of a drunk – ‘Tshort Voz’mi’, which means – The Devil Take It. I was orphaned at an early age. Far away, I don’t know where. Now I go around without a homeland. Where is my home? Ask the bottle. She’s left me for someone else. My sweetheart? Just this bottle. Tsulib dir, mayn fleshele, okh! Tshort vosmi! Zogt mir, menshn, farvos tut ir mikh hasn? Tsulib dir, mayn fleshele, okh! Tshort vozmi! People throw stones at me in the street. Tell me, people, why do you hate me? Oh, the devil take it. Vu iz mayn foter? Vu iz mayn muter? Vu iz mayn heymat, zogt mir vu? Tsulib dir, mayn fleshele, okh! Tsort vozmi! Where is my father? My mother? My homeland? Tell me, where? durkh dir, mayn fleshele, oy, a gute nakht! Карие глазки, где вы скрылись. Мне вас больше не видать.